This week we’re pleased to cast the spotlight on Share Magnet, a paid-advertising start-up based in Manhattan Beach, CA. Share Magnet is an advertising platform that brings together businesses (“advertisers”) that create ads (“magnets”), with individuals who are willing to share those ads on their social media networks (“sharers”). The business model is pretty straight forward. Businesses create magnets — short, text-based advertisements promoting their products, services, landing pages, and so on. Advertisers decide on a total budget for their ad campaigns, and Share Magnet takes a percentage off the top. Advertisers then decide on the value-per-click that they’d like to assign for the remaining balance of the campaign. Advertisers choose the demographics (gender, location, and interests) of the members they’d like to share the ads. Magnets will only be seen by sharers if their demographics match those that the advertisers have specified. The “Share Magnet Wizard” steps sharers through the entire process of claiming magnets they’re interested in. Sharers can customize the magnets to suit their own styles, and post the magnets to a variety of social networks from within the platform. When the total budget has been used up, the magnet disappears from the “Matching Magnets” section of the site. 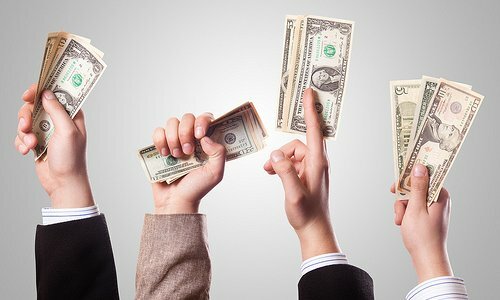 Sharers can cash out (to their PayPal accounts) whenever they reach a minimum threshold in their Share Magnet accounts. Advertisers can view and renew any of their campaigns, or create new ones, at any time. Share Magnet’s marketing proposition is that the popularity of social media and the amount of time we spend sharing information with each other is, in essence, a form of advertising. We let the people in our networks know about the best movies we’ve recently seen, the best restaurants we’ve patronized, and so on. According to Share Magnet, since we’re already using social media as a potent referral engine, businesses might as well capitalize on this, and individuals might as well benefit financially from at least some of their referral activities on social media. Although similar services have been around for a while, according to CTO and co-founder, Ben Stewart, Share Magnet is different because it’s completely transparent. “Our sharers can see the entire size of the campaign, how many people are sharing, even how many clicks are left in the campaign, in real-time,” says Stewart. “Advertisers have access to the same information as well”, he adds. 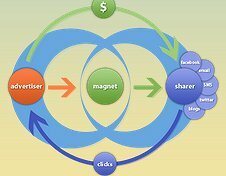 Whether you’re a business looking for an effective advertising platform or a publisher of social media content looking to monetize your efforts, Share Magnet may be of benefit to you. Stewart says that “people are not looking at Facebook ads like they used to.” Recent data suggests that he’s right. Ads posted from Share Magnet, on the other hand, show up in your social media update streams, “so your networks automatically see these ads as coming from a trusted source,” says Mr. Stewart. The result, says Stewart is that “Share Magnet ads tend to get retweeted and reposted as value added content.” It’s not uncommon, says Stewart, for ads to continue to get clicks for the advertiser, even after the budget has been used up. 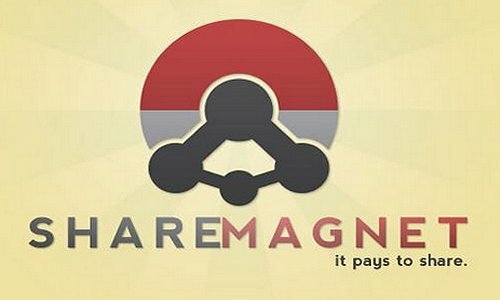 As for sharers, Share Magnet provides a way for them to monetize some of their social media content. “We limit our sharers to a maximum of 10 areas of interest to make sure they’re only posting content they have some affinity with,” Mr. Stewart says. That way, content is less about advertising and more about promoting, he says. Have you ever used a social-media based, pay-per-click advertising platform? Share your experiences in the comments below.